Jane, I am actually dying of CUTENESS OVERLOAD!!!! You are just too cute for school. I want to wrap you up and put you in my pocket. How utterly, utterly adorable. Thank you for taking part! NB Your elasticated waistbands are awesome. Oh - sorry - love the pjs! Mix and match is definitely the way to go! Oj Jane I love your PJs, they're gorgeous! I love the idea of adding sleeves to the sorbetto for a top too.... might actually have to do a sleeved version of the sorbetto for a summer top now I know the template is there already! Any if anyone is up for a virtual pillow fight, i'm in! Very sweet pyjamas. My husbie recently commented on the less than seductive state of my sleepwear...guess I might get around to making some new ones myself. 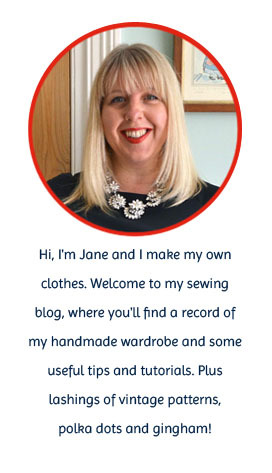 Oooh lovely Jane, I love both pairs and the Sorbetto is the perfect accompaniment! And look at those gorgeous french seams...swoon! I am also enjoying getting new reading options. I think I read the first Tales of the City years ago.... it'll go on my list now - thank you! Oh you must Winnie, it's like reading an old childhood favourite! Nice! I like em better mix n' match, monochrome is a little bit uniform-like (but still pretty). Great PJs! I adore the print you used and Karen is right, your little outfit is so cute! French seams - oh how I love french seams! I'll defintiely use them on my next pair! Very nice! And as a big fan of the likes of ER and Grey's Anatomy, I don't think there's anything wrong at all with the hospital scrubs look! Well done on finishing everything, it all looks lovely. Two pairs! They're both neat, but I'm particularly loving the floral - very cute! Lovely PJs. Such a great idea to use the Sorbetto top with sleeves as a top. Off to see if I have enough fabric to make myself one!! Love your Pj's, especially the sorbetto top. Think i might do something similar to match my new Pj bottoms! How did you do your elastic? Really nice PJ's tey look good on you! The gingham binding is a really nice touch! I should have planned to have enough fabric for a pj top like you! Cute - you look gorgeous! These are lovely - like everything you make! Very pretty! I love that they are as neat and tidy inside as they are cute outside. And I love the Tales of the City books too. I love your sleeved sorbetto andyouve reminded me, I need to read more Mauling! Also, I noticed, your wall color is almost exactly the same as my living room color (though in my pics it's more muted looking than it really is) crazy! I love your PJs, both pair. The trim on the Sorbetto is a sweet touch. These are lovely. I didnt have time to make my self some for this sew along but I am dying to at some point. What is the flowery fabric you used?